Sailors who carry a folding multi-tool on their belts will tell you that they do so for safety reasons and also because there’s great value in versatility. They know that even though they may not be carrying the perfect tool for a job, they have something that can do a variety of jobs pretty well. Jeanneau’s Sun Odyssey’s DS series is rather like that. If you were custom-building a yacht to sail across oceans and had a large budget, you might think about a boat that’s a little different from this one. If you had several children, for example, you might want to change the cabin layout to suit the needs of your flock. If you wanted to put the boat into charter, there are any number of yachts this size that can sleep more people. But if you want to do most or all of these things well and aren’t focused on getting perfection in these very narrow zones, the new Jeanneau Sun Odyssey 50DS is darned hard to beat. The owners of this yacht, the first 50DS in the U.S., typify this need for versatility. The couple has a 37-foot sloop that they love dearly and sail on the Chesapeake during the summer months. They also have plans to do some long-range cruising in the future, either by themselves or with occasional guests. To put the plan into gear, they bought this yacht and will put it into charter in the Caribbean for several years. For them a charter program means the yacht will help to pay its own way. It will also provide a great winter vacation while both of them are still working full time. After they retire, they will outfit the yacht for that extended adventure and head out over the horizon. They’ve done a lot of research, and they believe this yacht will suit them well. Its construction is sound, and it’s an easy-to-sail vessel with an electrically assisted sailplan, a lot of entertainment space, and a cleverly designed convertible interior. Because Jeanneau has been involved in the charter business for many years, the company knows what it takes for a yacht to survive in that demanding environment and also appeal to its own customers. Another builder specialty is to create yachts that are fun to sail but also produce a good turn of speed with minimal effort. Traditionalists tend to favor heavy, sturdy floating lifeboats for voyaging, but there are any number of contemporary skippers who have the same cruising criteria but are attracted to lighter and faster catamarans. Each boat type, of course, has advantages that sailors can argue about for as long as there is time to discuss the matter. In fact, this yacht fits nicely between design extremes. It’s neither a bouncy skimmer that flits across the waves nor a bricklike platform that is forever plowing through them. While the yacht’s features are optimized for coastal cruising, it is quite capable of crossing an ocean. Moderately light displacement helps make it fast in light winds, while the sturdy construction makes it capable of getting to the next port in fine style no matter what the weather. And it turns out that many of the qualities that make a good charter yacht are also good for shorthanded voyagers. For example, the two Harken electric genoa winches mounted near the helm station are all that’s needed for any headsail. Under way, I found that I could sit comfortably near the lee rail and turn the wheel with two fingers of one hand while I pushed a button to trim the jib with just one finger on the other hand. That’s a luxury worth savoring no matter whether you’re charter-cruising for a week in the islands or doing some summer sailing on Chesapeake Bay with the family. The numerous ondeck stowage spaces will work well for either chartering or cruising. In addition to the big lazaret, there’s a huge sail locker forward that will devour fenders, sails, awnings, and any other bulky lightweight items that might need to be stowed. There’s no doubt that this will be a great hiding place for children when the yacht is safely at anchor. The yacht has, as standard equipment, a furling genoa and a Quantum battenless mainsail set on a Facnor in-mast furler. The hollow-leeched main is one of those compromises that trade some boatspeed for a lot of convenience. But during my test sail on Chesapeake Bay last fall, we slid along at half the true-wind speed and had no problem tacking easily through 90 degrees despite light-air conditions and the small mainsail. The standard 140 percent genoa is also on a roller-furler. The obvious advantage of the simplicity of this rig for charter service translates nicely into easy sailing by a normal-strength couple when it is in private ownership. For those who prefer higher performance, the company offers a standard slab-reefed main with a full-roach leech. Performance was impressive under power. This yacht was equipped with an optional 100-horsepower diesel that could drive it to hull speed with a bit of throttle to spare. At 2,800 RPM we cruised at 8.6 knots; the standard 75-horsepower version would be good enough for most sailors. The turning circle was just under one boatlength, and backing down in reverse was straightforward and without drama. The way the boat handled would allow me to dock it, in those calm conditions, in a slip using just the engine. But the optional bow thruster is a convenience that will reduce docking anxiety in a stiff crosswind. 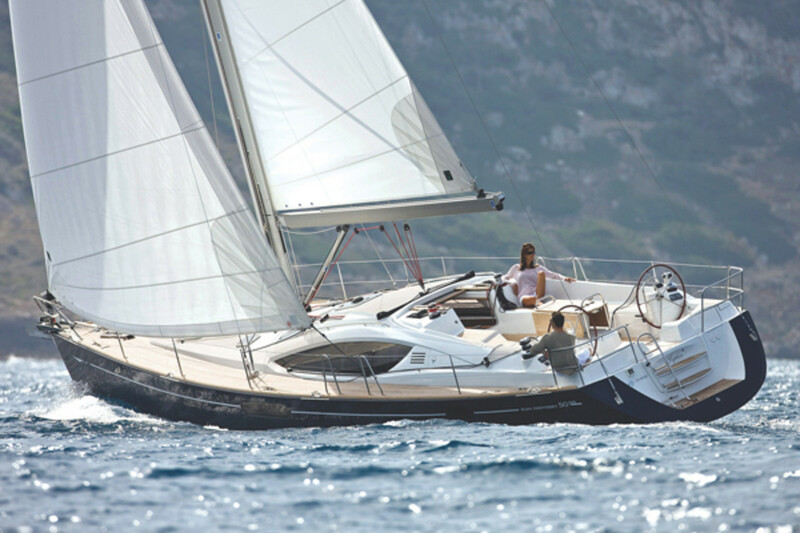 Jeanneau’s careful refinements of the Deck Saloon layout have caught on with its customers. Although the company has built DS models as small as 39 feet, the design approach really comes into its own when the yacht is 50 feet or larger. Then the raised sole amidships opens up the primary living spaces while providing usable stowage beneath, even when the hull form is relatively shallow, as this one is. If you miss the lack of countertop space in today’s electronics-filled nav stations, the space on this yacht will make you happy. The nav table itself holds either a chartbook or a folded paper chart; there’s also an expansive countertop ahead of it where you can spread out documents or books and even share them with another person on the settee. There’s also space for a flat-screen monitor/TV behind the nav seat, and the chartplotter is out at the helm where it belongs. Nice.